When nine-year-old Rob Cole felt the life force slipping from his mother’s hand he could not foresee that this terrifying awareness of impending death was a gift that would lead him from the familiar life of 11th-century London to small villages throughout England and finally to the medical school at Ispahan. Though apprenticed to an itinerant barber surgeon, it is the dazzling surgery of a Jewish physician trained by the legendary Persian physician Avicenna that inspires him to accept his gift and to commit his life to healing by studying at Avicenna’s school. Despite the ban on Christian students, Rob goes there, disguising himself as a Jew to gain admission. Gordon has written an adventurous and inspiring tale of a quest for medical knowledge pursued in a violent world full of superstition and prejudice. A fascinating historical film made in Germany (“Der Medicus“). First I was surprised that this was a German film since it has the look and feel of a Hollywood movie. In retrospect it’s also a bit logical. The book this film is based on and written by Noah Gordon, was not a success in the US, but all the more in Germany. It was also massively viewed in Germany and they made a mini TV series out of it. The rest of Europe unfortunately will only enjoy this wonderful film when it comes out on DVD. It’s a successful film with a lot of attention paid to the sets, costumes, music and CGI. If you add the even brilliant performances to it, you finally end up with an admirable and excellent product. The 150 minutes are over before you know it, because you are sucked into the story in a way. The performances were extraordinarily beautiful. Tom Payne as the inquisitive and innocent looking Rob, Stellan Skarsgard (“The Railway Man,” “Kill your Darlings“) as the itinerant quack who takes care of Rob and at the same time knows absolutely no compassion sometimes. I didn’t recognize Emma Rigby immediately, even though I only just saw her at work in “Plastic“. Her fake appearance in that movie (botox treatment most likely) was transformed miraculously into a more natural appearance. But what elevates this film to a higher level, is the casting of Ben Kingsley as the Persian philosopher who wants to pass his knowledge to motivated pupils and at the same time exhibits an unprecedented hunger for knowledge. 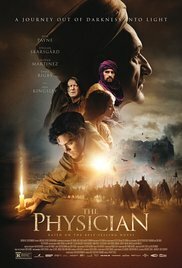 A masterful performance and a realistic portrayal of Ibn Sina, the Muslim physician, philosopher, physicist and scientist who made important contributions to medicine and whose studies were respected in Europe for a long time. Apparently Ben Kingsley likes playing the role of a physician or psychologist. He has the appropriate appearance and his charismatic personality is perfect for it. Just watch “Shutter Island” or “Stonehearst Asylum” and you’ll see. But also the overall appearance of the film looks grand and wonderful. From shabby, dark and especially dingy London to the oriental scenes in distant Persia and the Madrasa College. The costume department has done its utmost best to display it as authentic as possible. How Philipp Stölzl and Jan Berger have shaped this film and managed to make a movie with Hollywood proportions, is admirable. The only drawback is that there are also some Hollywood cliches like the storyline about Rebecca and Rob. Fortunately they avoided to show epic grand battles and focused on Ibn Sina and the influence of religion in that time. The only thing that bothered me personally was the so-called gift Rob had. The timeless topics about health and religious fanaticism dominate this wonderful film. Some won’t like the old-fashioned tone, but in the end I really enjoyed this medieval adventure film. A film set in an era when the Middle East was a source of knowledge and progress. Oh I need to see this one – looks great! !